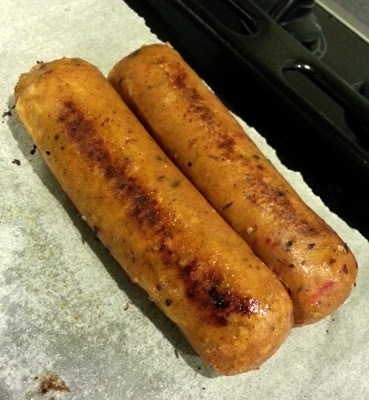 After deciding recently to incorporate more vegetarian meals into my diet I bought vegetarian sausages. 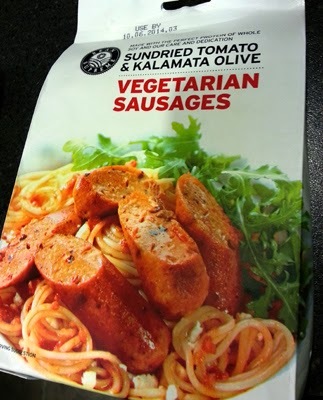 The Bean Supreme brand (NZ) has three different flavours of vege sausages. I tried out Sundried Tomato and Kalamata Olive. These (as the company name suggests) are made out of beans - soy beans. The ingredients list for this product isn't too long, and most of the ingredients are ones you would have in your pantry. A serving size is two sausages, there are 6 in a pack. Nutrition: 194 calories, 8.5g fat (4.8g saturated), 13.1g carbs, 4.3g sugar, 16.3g protein, 688mg sodium. 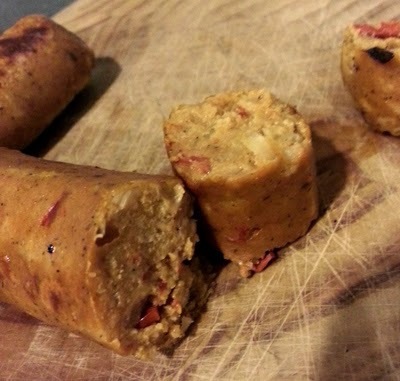 Pretty good calories with high protein, and better fat than regular sausages. The sodium is quite high but that's expected. Taste: These look like real sausages. I just put them in the oven until browned. 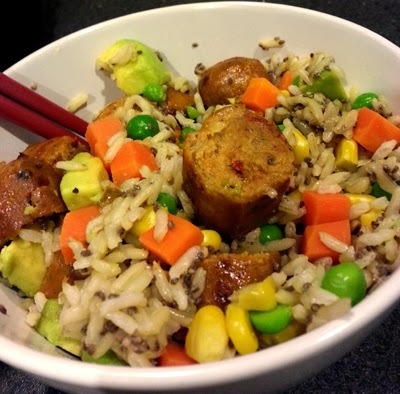 I first tried them chopped up into a bowl with rice and veggies. I like the taste of the sausages, but for me, this flavour is far too overpowering. A plain flavour would have been much better. Texture: Like I said above, the texture of these is really good. This flavour has chopped sundried tomato throughout. Value: These are about $7.00 NZD on special at the supermarket. Probably what you expect for a product like this, and with 2 to a serving you get three meals out of it, which isn't so bad. I really like the texture of these, but I just didn't enjoy this flavour. It was far too strong and overpowering and ruined it for me. I like sundried tomatoes and olives, but it was just too much. I have since tried the Rosemary and Sage ones and they are better. I'll definitely be buying the other flavours.